Animal Medication Direct :: Bird Products :: Ivermectin Spot-On Drops 0.1%. (Pharmaq Brand) 10ml. Ivermectin Spot-On Drops 0.1%. (Pharmaq Brand) 10ml. For non-food animals. 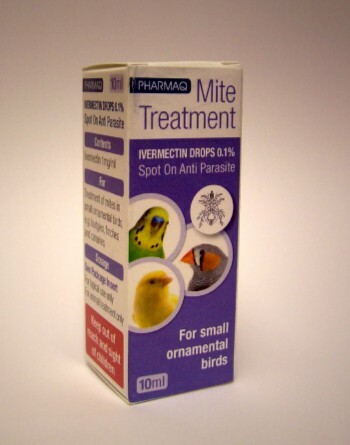 For treatment of mites and lice in cage birds. Contains enough product to provide a full course of treatment for up to 50 birds. Easy to apply with the dropper provided. Product information sheet with dosage guide is included.